Morecambe have completed the signing of striker Shaun Miller on a one-year deal. 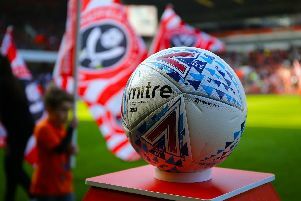 The former Crewe, Coventry and Sheffield United front man has been on trial with The Shrimps, featuring in the games against Blackpool and a Liverpool XI. The 27-year-old, who also spent time with Stevenage this summer, was a free agent after being released by Coventry at the end of last season. Boss Jim Bentley said: “Shaun has a good pedigree and played more than 150 games for Crewe before earning a move to Sheffield United and then Coventry. “He scored 19 goals in one season for Crewe so certainly knows where the goal is. “He suffered an injury recently and that has hit his career but we hope we can give him the chance to get his career back on track. Miller could be the first of three new signings ahead of the new League 2 season getting underway at Hartlepool on Saturday with Preston striker Jack Ryan understood to be on the verge of completing a loan move while Bentley also still needs a back-up goalkeeper. He will wear the number 16 shirt.